The question of who is an African has no answer yet; can whites, even fourth generation whites, be accepted by fellow blacks as Africans? In the meantime, the legacy of divisions— cultural, social, geographical, psychological— remain, stirring a groundswell of anger, identity, loss of identity, hope, anxieties, prejudice and sometimes despair that continues to disturb the surface of our everyday interactions.— Ian Bruce, from his program note for Groundswell. It's hard to believe that it's been fifteen years since Arpatheid ended. Sadly, the joy and hope the destruction of this social evil brought to fair-minded people all over this world has given way to a great deal of gloom and anxiety. The harmonious "rainbow nation" celebrated by Nelson Mandela on his inauguration has been dogged with persistent poverty and increasing crime. These dreams gone sour are the basis forSouth African playwright Ian Bruce to write Groundswell now being given its New York premiere by the New Group. The setting is a beach guest house on the barren diamond-diving West Coast of Africa. 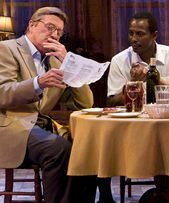 The play's three characters embody the sense of rootlessness that afflicts much of today's South Africa and drives men like Johan, Thami and Smith to such places. Johan (David Lansbury), an ex-policeman and Thami (Souléymane Sy Savané) maintain the guest house for its owners (presumably middle class Whites) during the off season. Thami came to the area to find out what happened to his father who disappeared while working in the mines. He stayed on as the gardener and as-needed manager because jobs elsewhere were scarce. He now hopes to save enough money to rejoin his wife and children and take them out of their slum home. Johan is a cop turned diamond diver and now part-time handyman who has a dark past and a drinking problem. He sees a recent government-run diamond mining concession as a chance to undo past sins, cement his friendship with Thami and escape his dead-end existence as a diver and guest house handyman. The likely means for the money to finance this scheme is the lone guest whose arrival in an expensive car stirs Johan's hopes for a likely investor. Smith (Larry Bryggman) does in fact carry a business card that tags him as the manager of an investment firm. However, the card is invalid since he's newly (and involuntarily) retired. He thus symbolizes the effects of post Arpatheid racial balancing on the well-to-do white middle class, which has frequently turned even Arpatheid opponents' "white guilt" and hope for a viable "rainbow Africa" into frustration and resentment. The plot unfolds during a single evening in the guest lodge's parlor/dining room. The deserted house, the ever present sound of the sea and a bell that evokes a T.S. Eliot poem make for an atmospheric drama— part psychological study in triplicate, part thriller, part political commentary. Like some of the flavorful old-time film noirs this setting brings to mind, the story is not without its implausible aspects. These are easily forgiven considering that Bruce manages to combine the thriller genre with a provocative exploration of post-Arpatheid South Africa; even more so because the New Group has enlisted an excellent thespian trio to portray the three very different men whose lives have been dead-ended and whose pleasant dinner turns into a desperate power struggle. The one flaw in this production is Scott Elliott's audience-unfriendly direction. The New Group's artistic director is not unfamiliar with the Acorn Theater's configuration so it's hard to understand his thoughtless blocking which has Larry Bryggman positioned with his back to fully half the audience for a good chunk of the intermissionless 140 minutes. I'm not a director but I sensed a potential problem during the very first scene in which Thami prepares for the lone guest's dinner. The dinner table is at the far side of Derek McLane's attractively over-furnished room, with its sheer-curtained windows providing glimpses of Johan and his dog and other shadowy images. The table setting for three makes it clear that this will be a dinner for all three characters. Knowing Elliott to be a savvy director, I assumed that since he okayed the furniture arrangement he would deal with the chairs positioned to that one man faces upstage and away from the audience. Not so! Mr. Elliott keeps Bryggman harnessed to that obstructed view seat long enough to be annoying and distracting. Bryggman is a wonderful actor and does his best to remain unfazed by the back-to-the-audience scene. Fortunately, Elliott otherwise handles the escalating tension well and Bryggman has some fine face front and character defining moments — especially when he first walks into the deserted room and during the scathing interchange when he rejects the idea that he needs to invest in Johan's scheme to make up for the wrong done to Thami's father by the mining company in which Smith held a few shares. (". . .just because a man had a few shares, he's not responsible for all the sins of the industry. . .I don't need redemption"). Lansbury, lays on the African accent with a shovel but it's authentic and it doesn't take too long to understand it. The wine he refuses at dinner, but predictably ends up consuming, deflects the implausibility of some of his over-intense Johan's actions. The tall and handsome Souléymane Sy Savané is a touching mix of naivete and toughness. He is the most grounded member of the trio. His final scene with Johan is a depressing but moving illustration of the identity issues that have stood in the way of that rainbow nation dream forging black/white friendship, and instead stirred a groundswell of troubling emotions. This well-acted and thought provoking play raises issues that are not limited to Africa. Even with an African-American president, our own country is still not without its groundswell of problems to disturb the surface of our multi-identity nation. From 5/04/09; opening 5/18/09; closing 6/27/09. Monday @ 8:00 PM, Tuesday @ 7:00 PM, Wednesday - Friday @ 8:00 PM, Saturday @ 2:00 PM (matinee) & 8:00 PM. Tickets: $49.